Here at XDA-Developers, we pride ourselves on being able to eke out the absolute most performance and functionality from our mobile devices. And as Portal Administrator / Editor-in-Chief for the site, it is my duty and responsibility to ensure that this information is highlighted through our media outlets. iOS is simply better than Android. It is with great pleasure that I announce today our new (and improved) focus. Rather than wasting our time with inferior mobile OSes, we will simply concentrate on the best: Apple iOS. While other OSes have downright copied Apple, some resorting so far as to traveling back in time to the year 2000 to launch their products, we can only recognize Apple iOS as the true grandfather of everything smartphone. Furthermore, OSes like Android and Windows Phone simply lack the resources and efficiency to compete in the modern mobile market. 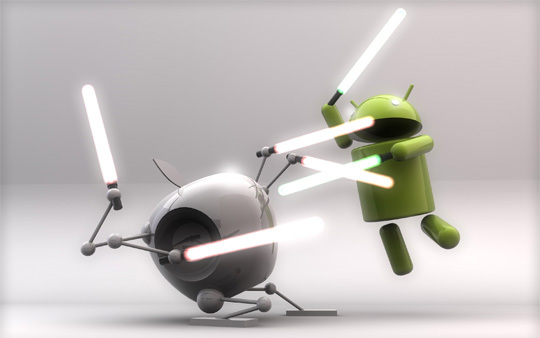 HP’s webOS and Nokia’s Symbian showed promise, but even they are simply no match for the Apple juggernaut. Thank you for your support and for making this transition a success. I look forward to a great year with iOS! OK, you didn’t REALLY think that we’d give up Android and WP7 in favor of iOS did you? And you didn’t honestly believe that Google was hosting a second week of I/O or that we were shutting down our marketplace. And most of all, I really, really hope you didn’t step on your Gorilla Glass-laden tablet or smartphone and use it as a scale.